(UK in Somaliland)- Women and girls often walk long distances to fetch water to meet their families’ basic needs. 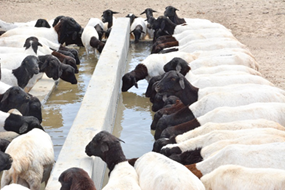 Access to water for agro-pastoralists in Aburin, a village 30 km west of Hargeisa, has been a major challenge. This community makes a living from farming and raising livestock, but the area has been severely affected by soil erosion and persistent water scarcity for the last two decades. Water facilities such as earth dams and berkads (underground water reservoirs) were left in ruins after years of no maintenance. 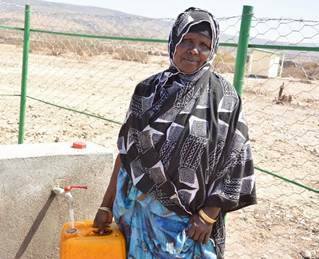 In response, the Ministry of Agriculture secured funds from the Somaliland Development Fund (SDF), supported by UKaid, to implement the Soil and Water Conservation Project in Aburin and surrounding villages. The project restores and raises land productivity through gully rehabilitation, construction of soil bunds, rehabilitation of damaged berkads and earth dams, and roof water harvesting. So far, 28 earth dams and 15 berkads have been rehabilitated and 8 subsurface dams and 5 school roof-water catchments built in an effort to increase access to free drinking water. The project has established Community Development Committees to make decisions on water and sanitation. Women’s groups have been successfully incorporated into these committees, meaning those who make most household decisions in this area are fully involved in decision making and implementation.